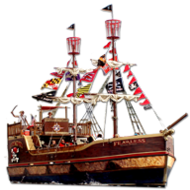 The traveling buccaneers that come to you! 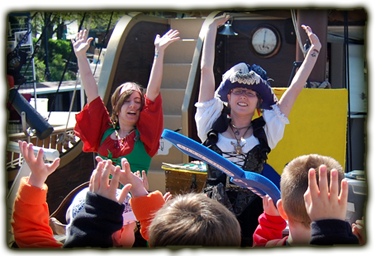 Our crew will invade your space with Stories, Games, and Treasure! Pirate Stories on the Go are available for preschools, schools, daycares, churches, learning centers, fairs and more. They include 45 minutes of interactive activities and stories with two pirates, tattoos and treasure for all, and time for pictures with the pirates. $200 Call to book your own story time! FREE and perfect for younger pirates! 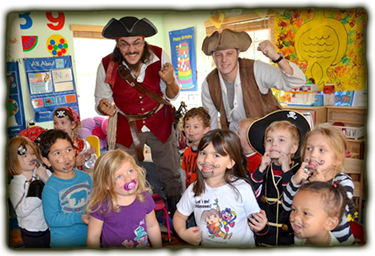 Urban Pirates’ weekly adventure story times include songs, games, stories and more, all aboard the pirate ship Fearless. 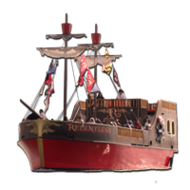 Discover your young one’s inner pirate by taking part in this outdoor activity in Historic Fells Point. Join us all summer long! While docked, our ship holds a maximum capacity of 49 people. Make sure you arrive early as spots for story times are first come first served, no reservations are taken. Available June 21 - August 25. 25% less on our 9:30am pirate cruise. Available June - August. Reservations required.